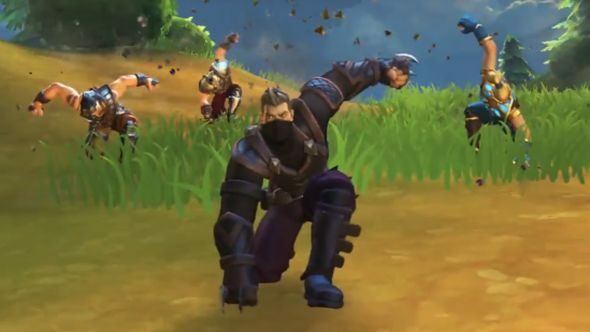 Realm Royale, Hi-Rez Studio’s battle royale (which began life as Paladins Battlegrounds), is now available in Steam Early Access. The game was first announced at Hi-Rez Expo in January as an in-game mode for Hi-Rez’s hero shooter, Paladins, but has now been released as a free-to-play standalone title. Operating in a standard battle royale formula (you know, 100 players, ever-shrinking map, loot-gathering early game), Realm Royale does offer a slightly different take on the formula. Primarily, that’s through the introduction of classes. While other battle royales send everyone into the game on a level playing field, Realm Royale features five characters with different abilities – engineers can deploy turrets, for example, while assassins can scout for enemies using drones. That’s a bit of a departure from the original idea, which featured Paladins’ full roster of champions working together in teams of four. A press release from Hi-Rez states that the classes are still “designed to support one another” in teams of four, but they won’t be as recognisable to Paladins fans as before. While Fortnite and PUBG task players with collecting rare loot from supply drops, Realm Royale focuses around forges, which can be used to craft legendary weapons as the matches progress. These become focal points for conflict as players fight over the chance to gather the best loot. I played an early build of Realm Royale at Hi-Rez Expo earlier this year. While a lot has changed between then and now, the game’s focus on teams and use of abilities has remained, and offers an interesting addition to the battle royale.